We had so much fun at our Rainbow Art Party, and I had a great time coming up with the food, and I can’t wait to share all the yummy details with you. While we were doing the art activities, I had a chip buffet set up for muching on. This was one of my very favourite ideas of the party. 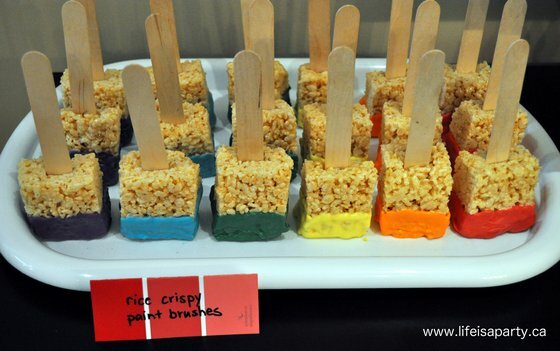 I set up a Rainbow Chip Buffet, and we made a fun label that said “Paint Chips”. Get it, I know I have a gift. 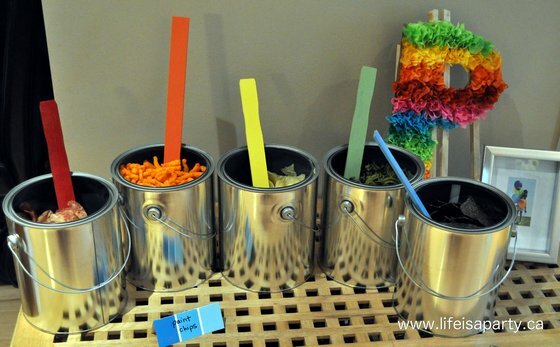 I bought unused paint cans at the paint store, and painted a paint stir stick for each colour we used. 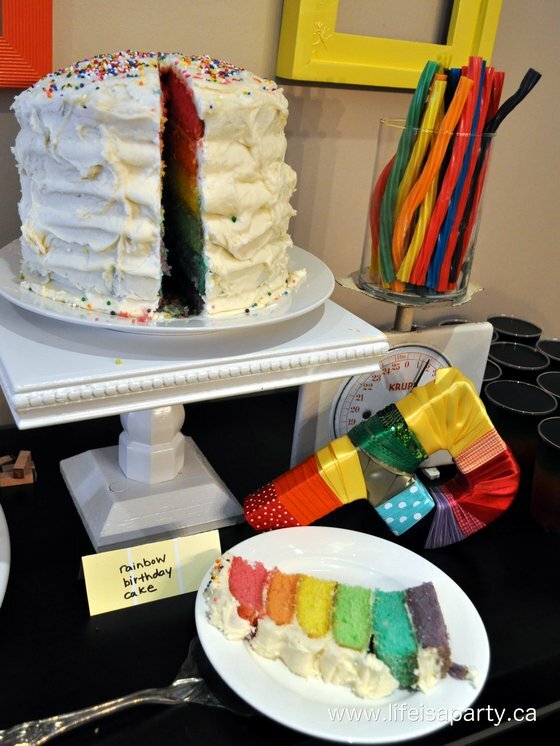 The main food event of the party was the Rainbow Dessert Table. I had a lot of fun putting it together. 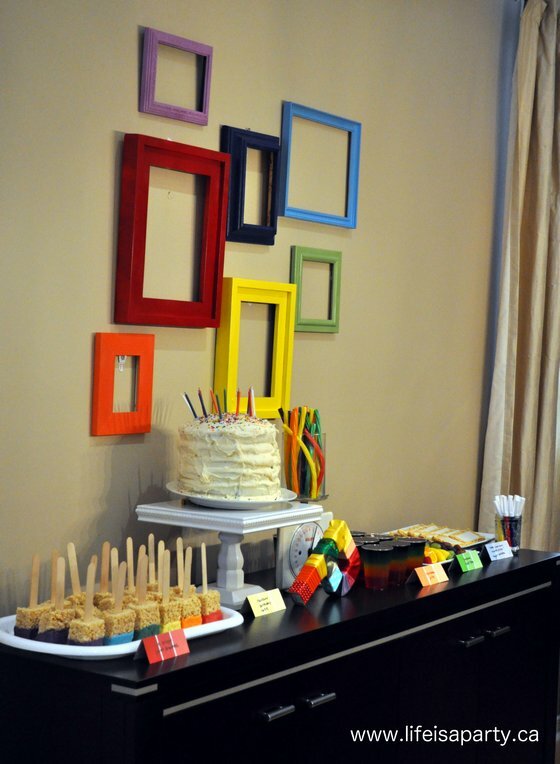 I started out with the pretty backdrop of rainbow coloured frames. I found them all at the second hand store for a couple of dollars each. I removed the backs and glass, and then painted them in different colours. I attached them to the wall with 3M hooks, they really work great and when you remove them, there really is no mark on the wall. 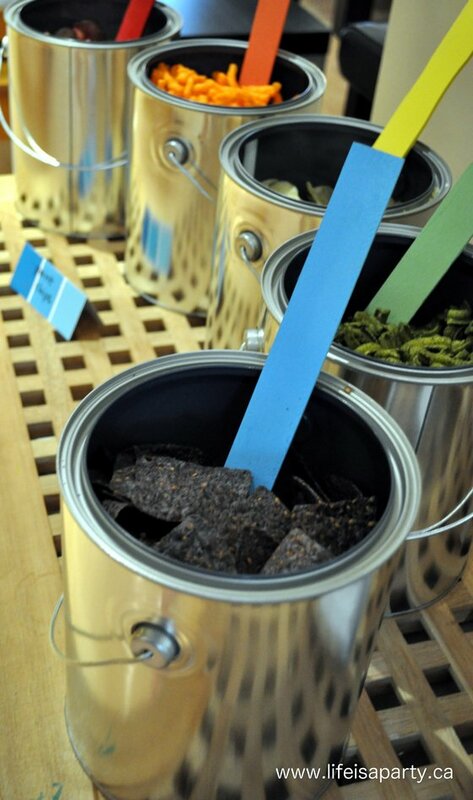 To make the food labels, I used some more paint chips. The centre piece of the table was the rainbow cake. I made it out of two cake mixes, and used food colouring to tint the layers. My one little tip: this time I bought disposable cake pans at the grocery store, it was so much easier than using my regular two pans, three times to bake the six layers. 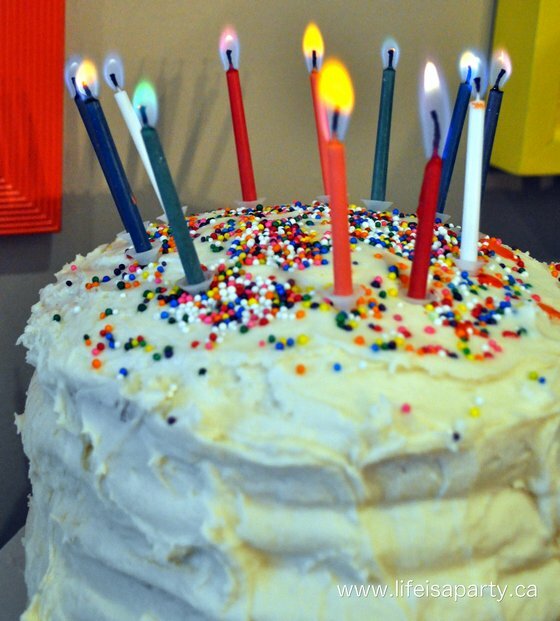 I bought the special birthday candles that have a coloured flame. They were a hit. The first slice was met by the appropriate oohs and aahs from the guests -as hoped for. Along with the Rainbow Birthday Cake there were lots of other sweet treats. 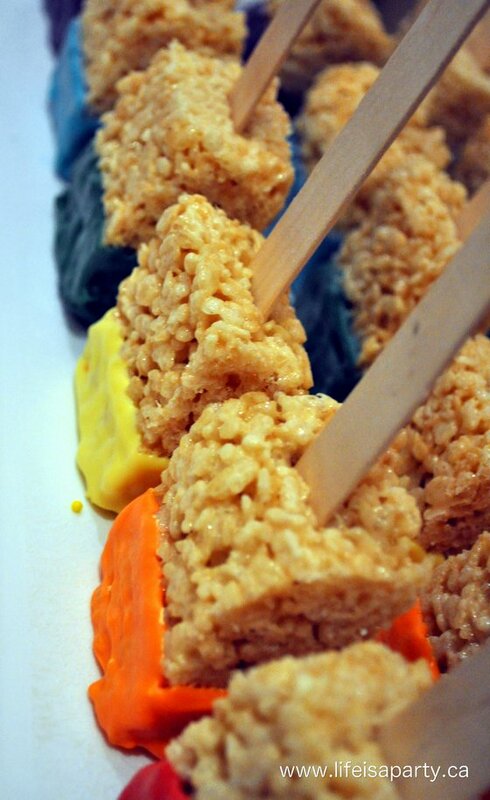 We made Rainbow Paint Brush Rice Crispies. 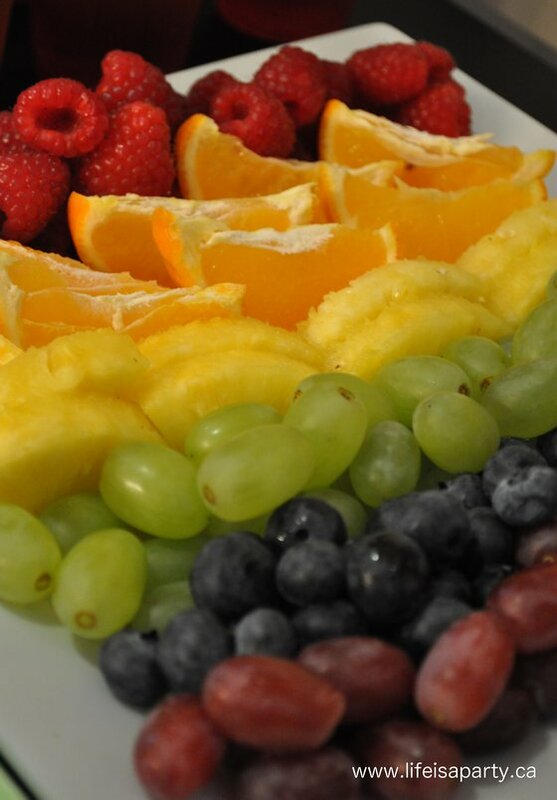 These were also a big hit -delicious and pretty easy too. 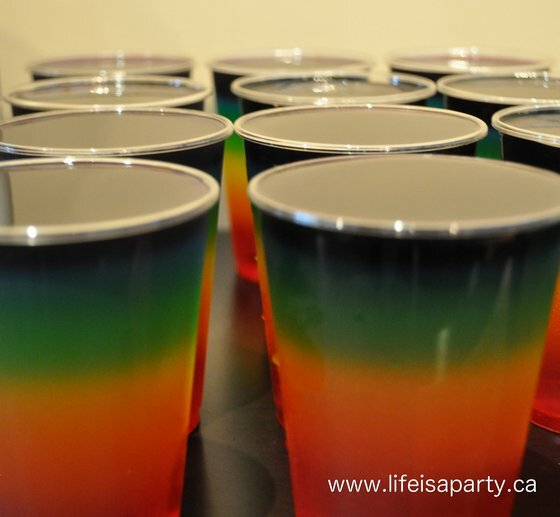 We also made Rainbow Jello. It looked so pretty. Lastly, my friend Heather made the amazing “Make Your Own Masterpiece” Sugar Cookies. 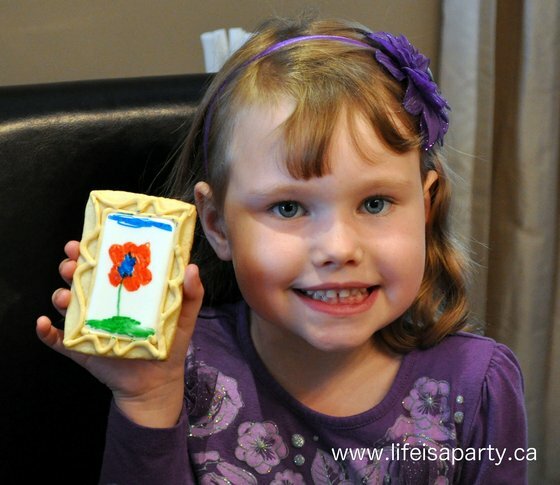 She made sugar cookies, and flooded them with white royal icing to make the perfect cookie canvas’, and outlined it all in a sweet little icing frame. 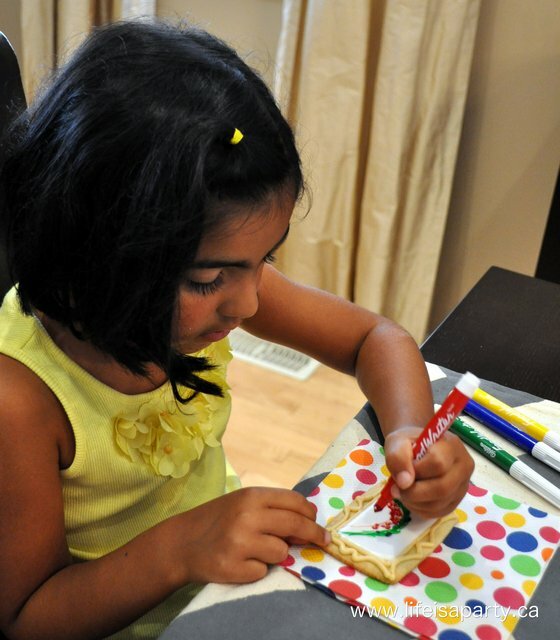 Guests used edible markers to draw their own picture. 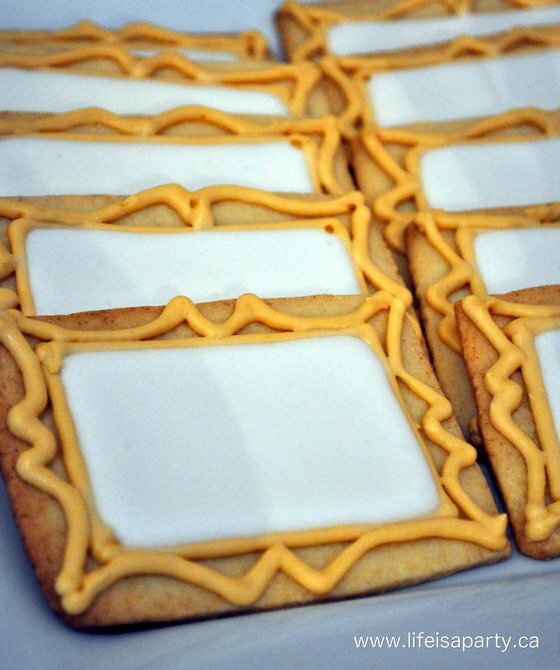 These were also a huge hit -they were just so cool…and delicious. 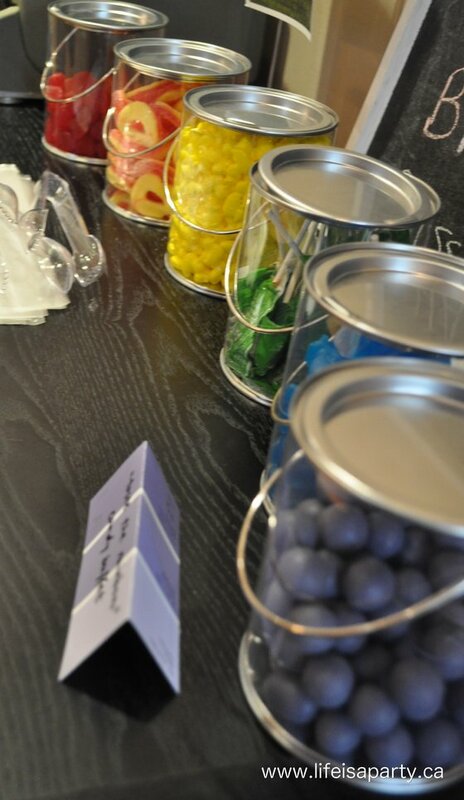 As another treat for the loot bags we set up a Rainbow Candy Bar. I found the fun little paint buckets at the dollar store, and then we found candy in every colour at the bulk store. It looked so pretty, but I have say, so much candy left over. The party was a great success, and the birthday girl was all smiles. 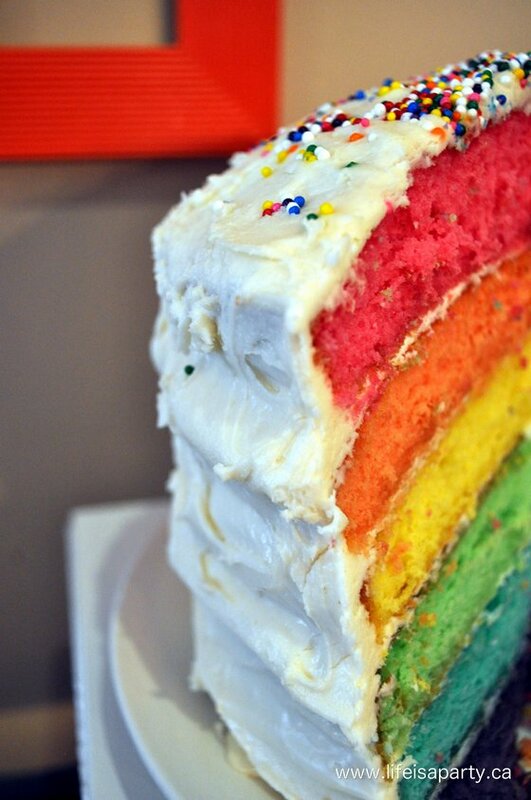 With a table full of Rainbow Desserts, life really is a party! 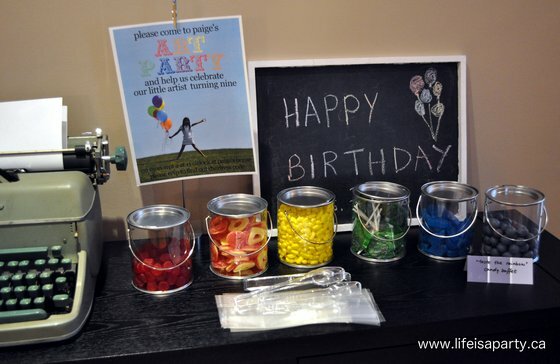 In case you missed it, check out all the Rainbow Art Party Decorations here, and all the fun Rainbow Art Party Activities here. This post is linked up at Link Party Palooza at Tatertots and Jello, and Between Naps on the Porch. 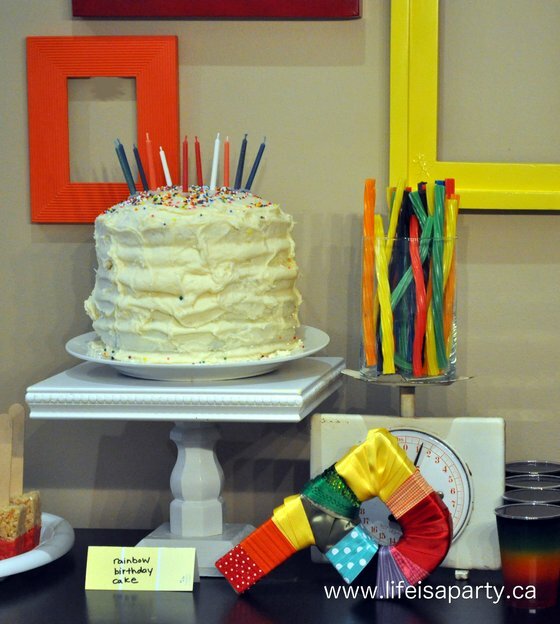 Love the cake idea…. maybe a theme I can use for the february birthday coming up as winter often needs some colour and cheer by then. Were those chocolate covered blueberries by any chance? Any of those left over??? What a fabulous party! 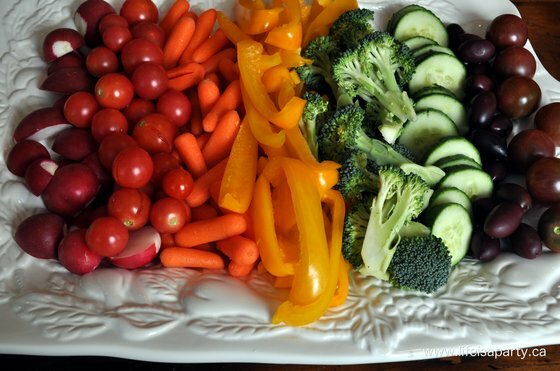 Everything is so clever and yummy-looking! 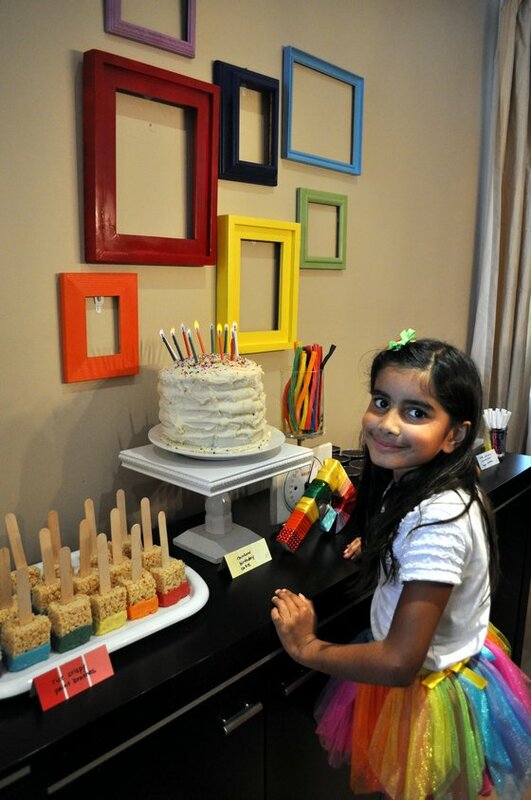 Love the birthday girl’s big smile and cute rainbow skirt!. That cake is fabulous!